President Rivlin pays condolence visit to family of Reuven Shmerling, murdered in terror attack on eve of Sukkot holiday. 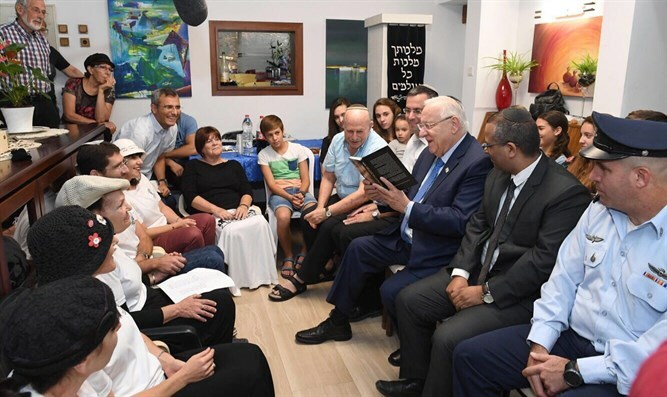 Israel’s President Reuven Rivlin arrived this morning, Sunday, to the Shomron community of Elkana for a condolence visit to the family of Reuven Shmerling, who was murdered in a terror attack in the Israeli Arab village of Kfar Qasim on the eve of the Sukkot holiday. Arriving at the house, Rivlin met with Shmerling's children and with his wife Chana. Chana told the President that the Shmerlings are among the first residents of the community. “We will continue, because this is our land,” she said. Shmerling's family told of their plans to celebrate his 70th birthday with a gathering of all the extended family on the Sukkot holiday, and of their painful separation from him on his birthday. His daughter, Yonit, spoke about Yom Kippur prayers which Shmerling had led, enhancing the spiritual experience of the worshipers with his devotion. “He was like David, Israel’s singer of songs. He led the prayers, was murdered on the day he was born, and apparently was also a hero, because he also fought,” Chana added.